Facebook is working hard on improving privacy features. 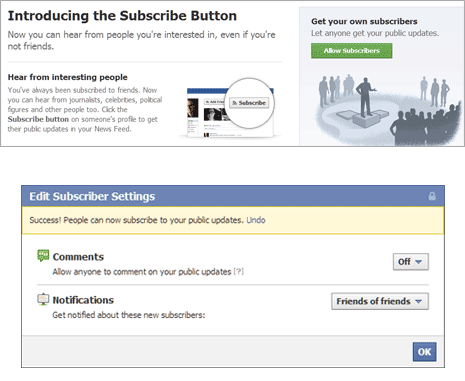 It has introduced new ‘Subscription’ feature that allows you to show Subscribe button on your Facebook profile. Other Facebook users can click Subscribe button on your Facebook profile and receive latest Public Only updates from you. It is a neat way of following updates from famous personality or people on Facebook without actual access to their profiles. 1. Once you login into your Facebook profile, open Facebook Subscribe webpage on your computer. This “Introducing the Subscribe Button” webpage explains basic concept and implementation of the new Subscribe button on Facebook. 2. Click Allow Subscribers button on right side under “Get your own subscribers Let anyone get your public updates“. This will open ‘Edit Subscriber Settings’ box. Click OK to enable this option and Subscribe button will show up on your Facebook profile to other users. 1. Once you activate Subscribe button on your Facebook profile, you can control various options and settings for the same from Subscribers tab on the left side of the Facebook profile. 2. Subscribe button wont be displayed on Facebook profile of every user. Only users who activate the Subscribe feature (as explained above) will have Subscribe button. 3. Only posts marked as Public will show to users who have subscribed to your updates. Also, you can see all users who have subscribe to your public updates from Subscriber tab on the left sidebar of Facebook profile. Subscribe button will not show, if you have not manually activated it for display. However, if you have enabled it to display and now want to get rid of Subscribe button, following is easy procedure to remove Subscribe button from your profile. 1. Open your Facebook profile by clicking your profile image and then click on Subscribers tab on the left side of your profile page. 2. Click Edit Settings button at top right part. Then select Off next to Subscribers option (Allow people other than your friends to subscribe to your public updates). Then click Ok button to save changes for removal of Subscribe button. With Subscribe option you can add subscription as per your choice. Using this, you can follow latest public updates from your favorite personalities and users on Facebook. 1. Open the Facebook profile of user(s) whose public updates you want to view in your Facebook profile timeline or updates stream. 2. Click Subscribe button at top right part of their Facebook profile. Now you have active subscription of public updates of that specific Facebook user.